Horizon KRIXUS Review: A Rewickable Sub-Ohm Tank That’s Up There With The UWELL CROWN. HorizonTech is well known for their Arctic series sub-ohm tanks. 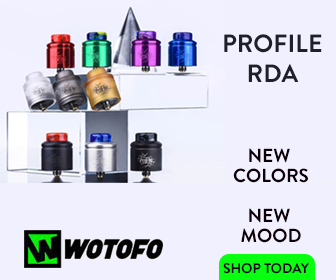 These tanks are immensely popular, well received by critics, and used by all kinds of vapers the globe over. Well, HorizonTech is now officially back with something very interesting. It’s called the KRIXUS sub-ohm tank, and I’ve just spent a week testing it. HorizonTech has made a leap that most other tank manufacturers have chosen not to – at least not yet, anyway. HorizonTech has decided to bring out a rewickable sub-ohm tank. Just how good is a sub-ohm tank with a ceramic coil? We here at VapeBeat have the pleasure of finding out and so do you. Encased in a clear acrylic styled case you have the Krixus Sub-Ohm Tank with a preinstalled Rewickable Ceramic Coil (RCC) which is rated at 30-80W, a spare RCC that is also rated at 30-80W, a spare pyrex glass tank tube and spare O-rings. Also included is a leaflet on proper maintenance and cleaning of your RCC. The backside has information on the Krixus and the contents. A simple but effective presentation. 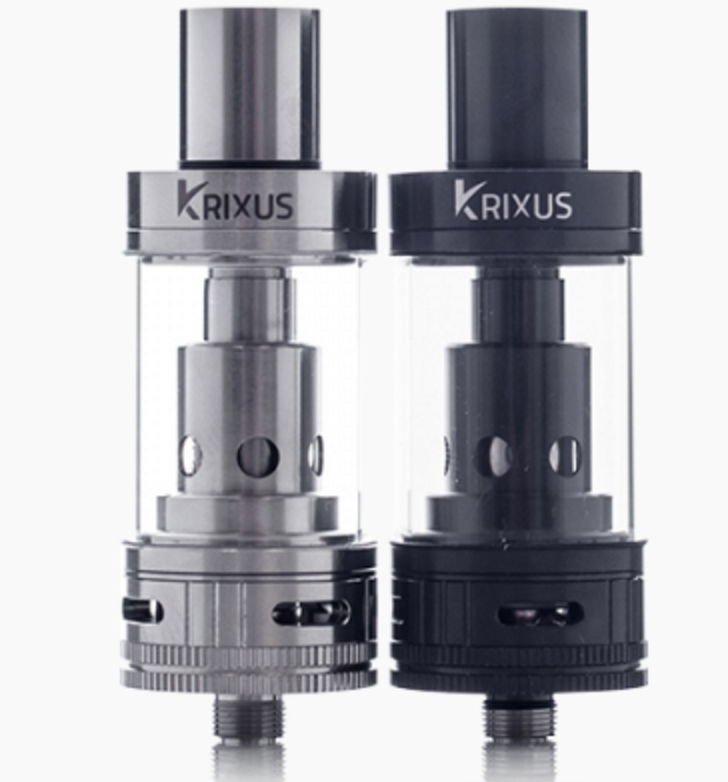 At first glance, the Krixus seems to appears to be your standard, basic sub-ohm tank. The design is simple and straight-forward with very little flare which means the tank itself isn’t all that eye-catching. Speaking personally, I prefer understated design when it comes to tanks. It means they’re simple to operate and there’s fewer parts to go wrong — always a good thing. And the KRIXUS is all of these things: it’s simple to use, simple to take apart, and simple to setup. 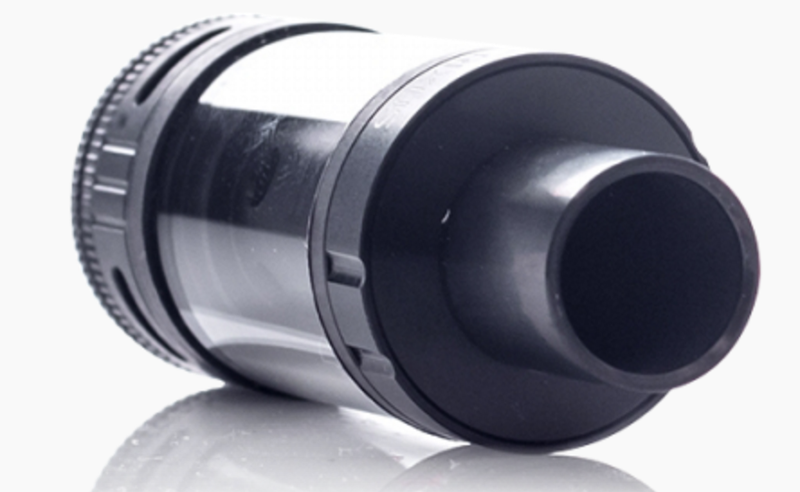 The removable 510 drip-tip is Delrin with Stainless Steel wrapped around it. The top fill is wide and easily accommodates most glass drippers. The wicking holes on the chimney are big and allow plenty of juice to seep through, reducing the amount of time you need to leave it priming. The four-hole airflow adjustment on the bottom goes from wide open and stops at fully closed. A little knurling grip at the bottom is nice for your fingers as it gives you something to grab. Unscrew this portion of the tank and you’re presented with the coil, which, of course, is rewickable. After priming the RCC and filling the Krixus up with some Eclipse by Space Jam (look out for my review of this stuff very soon), I waited a few minutes before I began vaping the Krixus. I started at 30W, playing it safe to begin with, for about a quarter of the tank but that just didn’t seem like enough, so I bumped up my power to 35W and found the KRIXUS performed better here. The clouds were bigger, the flavour more intense. Then came 40W, 45W, getting closer to the limit, but I wanted more so I went higher. 50W was not bad but I wanted more, so I took her straight up to 57.5W and turned out to be the exact sweet-spot I was looking for. I finished off the first fill at 57.5W and it was enjoyable but I needed to really push this tank, and this is what I did with my second run. With the RCC being rated 30-80W I wanted to push as close to 80W as possible in order to see if the KRIXUS could hold its own. I turned my power up to 65W and that was very enjoyable compared to the previous 57.5W. 70W was the next level and the tank began to get warm at this point, which is normal. 75W was the shining point for this tank, as it crapped out more or less around the 80W after a few fast blasts. Interestingly, it could handle chain-vaping at 75W, though this is definitely the KRIXUS’ upper limit for performance. HorizonTech claims the RCC inside the KRIXUS can last up to 6 months with proper care and maintenance. If this claim holds true then that will be a lot of money saved from buying coils every two to four weeks. This is why most people use RTAs and RDAs. It’s not just about flavour and clouds; they’re also infinitely cheaper options in the long run. Let’s talk about the flavour and the cloud production now. No matter what wattage I vaped at the flavour just got better and better. On occasion the flavour was VERY intense, but, again, this is to be expected with ceramic coils, so nothing to worry about there. Vapers refer to this phenomenon as “over-flavouring” but do not let that put you off — this effect goes away after the second tank or so. Just as is the case with home-built coils, it takes a bit to get everything settled in. If you’re looking for BIG flavour, the KRIXUS is a great option. Cloud production is VERY decent as well; though for big, dense plumes you want to be hitting it above 60W — anything below that is just average. Overall, the KRIXUS is a very, VERY capable tank. It reminds be a lot of the original UWELL Crown, which is a big compliment, I know, but the performance is definitely up there. Chuck in the ability to re-wick and a ceramic coil that lasts up to six months and what you’re looking at here is one of the most compelling sub-ohm vape tanks available right now. I’ve had a great time testing the KRIXUS out and it will 100% be staying in my weekly rotation of tanks. No doubt about that. I like the way it vapes, its HUGE flavour and the utility it brings to the table — I mean, all you gotta do is by cotton, which costs like a $1 a bag, for six months. This is a HUGE saving. It is also why NO ONE else is doing this, as they’re making a KILLING selling you pre-made coils for $10-$15 a pack. The flavour rating of the Krixus is a 10/10 which beats my favourite flavour tank, the Herakles Plus. The cloud production rating is trickier, but I have chosen to give the Krixus an 8/10, as it’s decent above 60W but average below. The actual overall rating that I give the Krixus is a 9/10. If you want a tank that performs well and doesn’t drink ejuice like a tramp from Scotland then the Krixus tank is one of the best options you have available to you right now, aside from the infamous UWELL Crown tank of course. 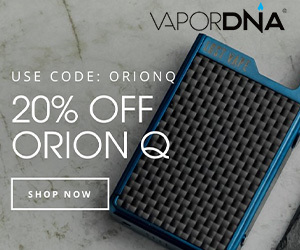 Click the banner below to check out the best price on the web for the Horizon KRIXUS.